LOS ANGELES, Nov. 18, 2015 /PRNewswire/ -- Kia Motors America (KMA) today unveiled the all-new 2017 Sportage at the Los Angeles Auto Show. 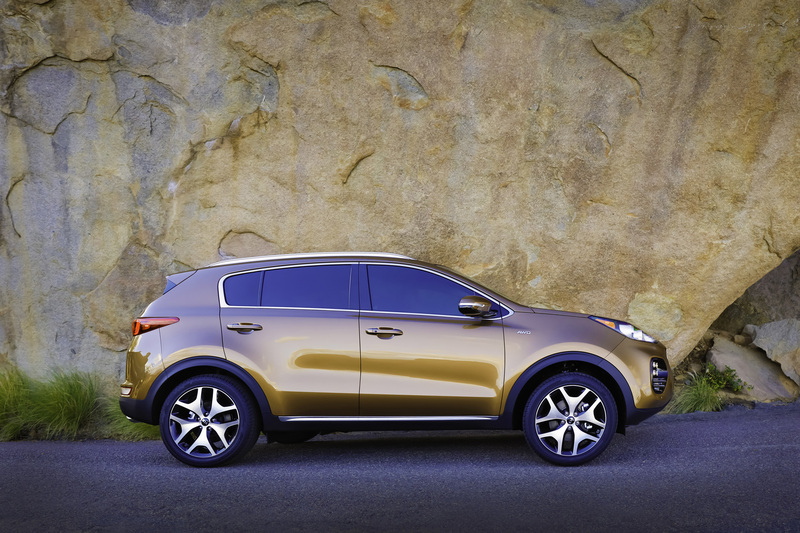 The fourth-generation Sportage, KMA's longest-running nameplate, wraps stunning contemporary design around a structure that is both stiffer and more spacious than before. Advanced driver assistance technologies, significant suspension and steering improvements, and available intelligent AWD vastly improve the Sportage's driving dynamics while premium materials and world-class craftsmanship create a class-up experience in an otherwise utilitarian segment. 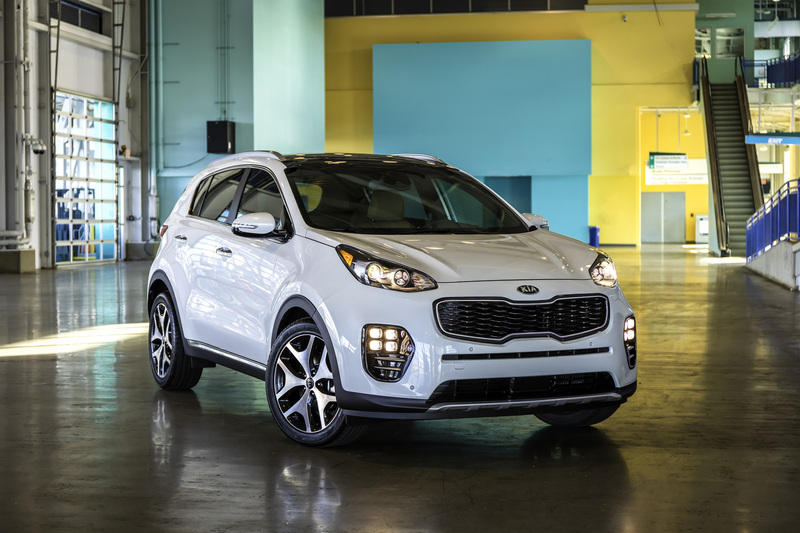 "Simply put, the Sportage is a breed apart in the compact CUV segment," said Orth Hedrick, vice president, product planning KMA. 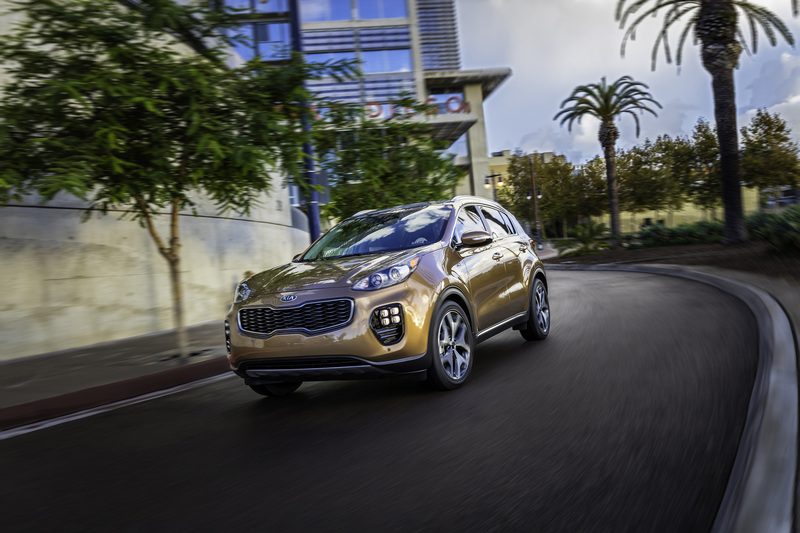 "Instead of bland utility, the Sportage combines distinctly European and sporty styling with thoughtful design and functionality, including innovative packaging, premium materials, a turbocharged engine and surprising features. Sales of compact CUVs are on a sharply upward trajectory, and the all-new 2017 Sportage hits the sweet spot by providing an alternative for those seeking to express themselves with a vehicle that's versatile enough to suit their unique lifestyle." The all-new Sportage's roomier, more luxurious cabin features an impressive level of craftsmanship, with high-quality, soft-touch materials and a range of technologies improving overall comfort, convenience, and connectivity. Updates to the drivetrain provide enhanced efficiency and performance, while changes to the suspension deliver better ride and handling. Like the outgoing model, the all-new Sportage will be built at Kia's production facility in Gwangju, Korea, and be available in three distinct trim levels (LX, EX, SX Turbo) when it goes on sale next year. Pricing will be announced closer to the Sportage's on-sale date. Designed under the direction of Kia's president and chief design officer, Peter Schreyer, the 2017 Sportage's exterior juxtaposes smooth curves with sharp creases. Although every body panel is new, the "face" of the new Sportage features the most significant change over the outgoing model. Kia's hallmark "tiger-nose" grille resides vertically in the front fascia while the headlights are positioned higher, sweeping back along the outer edges of the sharply detailed hood. A lower, wider front clip – enlarged to provide greater engine cooling – adds visual volume to the lower half of the Sportage's face, resulting in a planted and aggressive stance, though it keeps the same overall width, 73.0 inches, as its predecessor. The wheelbase has been stretched 1.2 inches (now 105.1 inches), while overall length has increased 1.6 inches to 176.4 inches. Despite its increased dimensions, the all-new Sportage remains instantly recognizable thanks to its sloping roofline and sharply raked rear window. Short overhangs and wheels pushed to the corners continue to be Sportage signatures, while a longer, more aerodynamic spoiler and bolder wheel arches give the compact CUV a more dynamic appearance. Tasteful chrome touches surround the windows, giving the Sportage LX and EX a more upscale look, while the top-of-the-line SX Turbo model adds more visual interest with new "ice cube" LED fog lamps, HID headlamps, LED tail lights, satin exterior trim, metal-look skid plates, and 19-inch alloy wheels. Inside, the new Sportage's driver-oriented cockpit features a simple and modern design with clean horizontal lines emphasizing a more spacious interior. The lateral design of the dashboard divides it into two clear zones. The upper "display" zone delivers information to occupants via the instrument panel and new color touchscreen, which is canted 10 degrees toward the driver. The lower half, or the "control" zone, features easily identifiable switchgear to operate the available dual-zone climate system, audio and secondary controls. Similar to the touchscreen, the center console has been angled to face the driver. Giving the Sportage a more premium feel is the availability of either a single-tone (black) or two-tone (Dark and Light Grey or Black and Beige) cabin, while metalwork elements blended with soft-touch materials contribute to a more upscale interior. The EX and SX Turbo models add sumptuous leather upholstery, and the SX Turbo includes a D-shaped, heated and leather-wrapped steering wheel with paddle shifters, piano black trim along the center console, aluminum alloy pedals, and authentic stitching on the dashboard. As a result of the increased exterior dimensions and clever packaging, interior dimensions have grown, offering more space and comfort. Headroom has increased 0.2 inches to 39.3 inches in the front and 0.6 inches to 39.1 in the rear, while legroom has increased slightly in front and 0.3 inches in the rear to 38.2. The second row has a 1.6-inch lower interior floor (ground clearance is unchanged at 6.4 inches for front-drive models and 6.8 inches on AWD) and 1.2-inch lower rear bench hip point, benefitting second-row passengers with more headroom (up more than a half inch) and a more comfortable seating position. Offering even more comfort are options such as three-level front seat heaters, 10-way power control with lumbar support for the driver's seat, and eight-way power control for the passenger seat. Just as passenger space has increased, so has cargo room. Thanks to an innovative dual-level cargo floor and a widened luggage area, cargo capacity behind the second row has grown substantially from 26.1 cu.-ft. to 30.7 cu.-ft. (SAE). By relocating the license plate from the bumper to the tailgate, the lift-over height has been lowered for easier loading and unloading. A Smart Power Liftgate™, which automatically opens when the key fob is within three feet of the vehicle, is also available. Outward visibility has been improved by mounting the side mirrors lower on the doors, using thinner A- and C-pillars and incorporating larger rear glass in hatch. This feeling of spaciousness is further enhanced with an available panoramic sunroof that is 4.1 inches longer than the outgoing model's. Kia engineers reduced noise, vibration, and harshness (NVH) through the application of a quad-bushing setup in the rear suspension to isolate road noise and additional sound-absorbent materials throughout the Sportage's wheel arches. Wind noise also is reduced as a result of thicker front side glass, a lip seal for the panoramic sunroof, and additional soundproofing in the doors. The 2017 Sportage is also more aerodynamic, with a coefficient of drag that's been reduced from .37 cd to .35 cd. The structure of the all-new Sportage is significantly improved due to the extensive use of Advanced High Strength Steel (AHSS). With 51 percent of the Sportage's body-in-white consisting of AHSS versus the outgoing model's 18 percent, torsional rigidity has improved 39 percent. Furthermore, the increased use of advanced hot-stamped steel improves body integrity. The material has been used to reinforce the A-, B- and C-pillars, side sills, roof structure, and wheel arches. As a result of its stronger core, Sportage engineers are targeting the compact CUV to earn an overall five-star National Highway Traffic Safety Administration (NHTSA) rating and an Insurance Institute of Highway Safety (IIHS) Top Safety Pick+ designation. Steering is another area of improvement, as engineers mounted the steering box farther forward on the axle for better weight distribution. With 25 percent less friction than the previous unit, the 2017 Sportage offers smoother and more precise steering inputs and better feel. The all-new Sportage features a number of new and advanced on-board technologies2 to elevate the driving experience and keep drivers connected. The LX comes equipped with a standard 5.0-inch color touchscreen that features Bluetooth® hands-free phone operation and streaming audio, SiriusXM®4 satellite radio, and rear-camera display5. 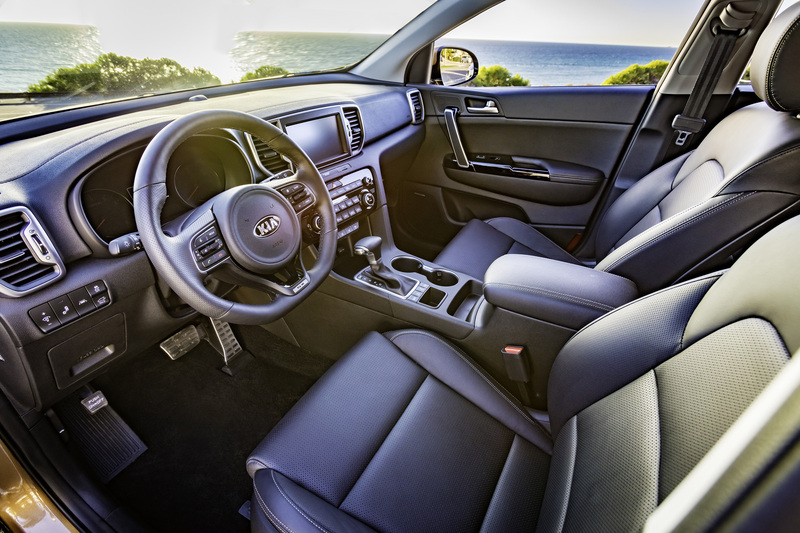 A move up to the EX brings a 7-inch capacitive touchscreen with the latest version of Kia's award-winning telematics and infotainment system, UVO3, which is making its debut on the all-new Sportage. Complete with Android Auto6, Apple7 CarPlay® (late availability), and UVO eServices8 featuring 14 telematics services, the enhanced system features up to 8 GB of music storage, access to onscreen apps such as Pandora® and Soundhound and Wi-Fi tethering capability, all free of charge. The SX Turbo features all of the above, plus an 8-inch touchscreen and onboard navigation. All Sportages come standard with a 160-watt six-speaker audio system, and a powerful 320-watt Harmon Kardon® premium audio system is available, featuring eight speakers including subwoofer, an external amplifier, and Clari-Fi™ music restoration technology for unrivalled audio quality. Kia Motors America (KMA) is the marketing and distribution arm of Kia Motors Corporation based in Seoul, South Korea. KMA proudly serves as the "Official Automotive Partner" of the NBA and LPGA and set an all-time annual sales record in 2014, surpassing the 500,000 unit mark for the third consecutive year. KMA offers a complete line of vehicles, including the rear-drive K900 flagship sedan11, Cadenza premium sedan, Sorento CUV, Soul urban passenger vehicle, Soul Electric Vehicle12, Sportage compact CUV, Optima midsize sedan, Optima Hybrid, the Forte compact sedan, Forte5 and Forte Koup, Rio and Rio 5-door subcompacts and the Sedona midsize multi-purpose vehicle, through a network of more than 765 dealers across the United States. Kia's U.S. manufacturing plant in West Point, Georgia, builds the Optima* and Sorento* and is responsible for the creation of more than 15,000 plant and supplier jobs. 1 These features are not substitutes for safe driving, and may not detect all objects surrounding vehicle. Always drive safely and use caution. 3 The Bluetooth® word mark and logos are registered trademarks owned by Bluetooth SIG, Inc. and any use of such marks by Kia is under license. Other trademarks and trade names are those of their respective owners. A compatible Bluetooth® enabled cell phone is required to use Bluetooth® wireless technology. 4 Sirius services require subscriptions, sold separately after 3-month trial included with vehicle purchase/lease. Subscriptions governed by SiriusXM Customer Agreement at siriusxm.com© 2041 SiriusXM Radio Inc. Sirius, XM and all related marks and logos are trademarks of SiriusXM Radio Inc. These features are not substitutes for safe driving, and may not detect all objects surrounding vehicle. Always drive safely and use caution. 5 The rear-camera display is not a substitute for proper and safe backing-up procedures. The system may not detect every object behind the vehicle. Always drive safely and use caution. 6 Android™ is a trademark of Google, Inc.
7 Apple® is a registered trademark of Apple Inc.
8 No charge for UVO eServices app. Normal cellular service rates will apply. 9 Pandora® is a registered trademark of Pandora Media, Inc.
10 Clari-Fi™ and QuantumLogicTM are trademarks of Harman International Industries, Inc.
11 2015 K900 V8 available in select trims and in select markets with limited availability. 12 Soul EV in select markets with limited availability.